Your dog will love you if you bring him on holiday here. One well behaved dog is welcome and will be very happy on holiday in Beacon View Barn. They’ll love the diverse walks that are available to them from their doorstep, Our lanes and footpaths lead through some of the most spectacular countryside in Britain. The countryside code must be followed at all times. It is a privilege to live, work and play in this beautiful National Park but please note there is Open Access Land where dogs must stay on public rights of way. Within the National Park there is over 55 square miles of Forestry commission offering lots more freedom with more tracks and paths to enjoy, isn’t that fantastic?! We are close to Yorkshire’s heritage coast which has some great coastal walks as well as some super dog friendly beaches too. Some of our beautiful beaches have summer restrictions so autumn and spring breaks are the ideal time to explore the canine wonders that Yorkshire has to offer. Crag House Farm is a working farm and Beacon View Barn’s adjoining fields are often full of sheep and lambs. The garden is large and enclosed but not necessarily dog proof. We have horses here ourselves and horses are ridden past the cottages on an almost daily basis. Therefore it is imperative that you take great care of your dog when on holiday. Please follow the country code, close all gates and keep your dog on a lead when in close proximity to stock. 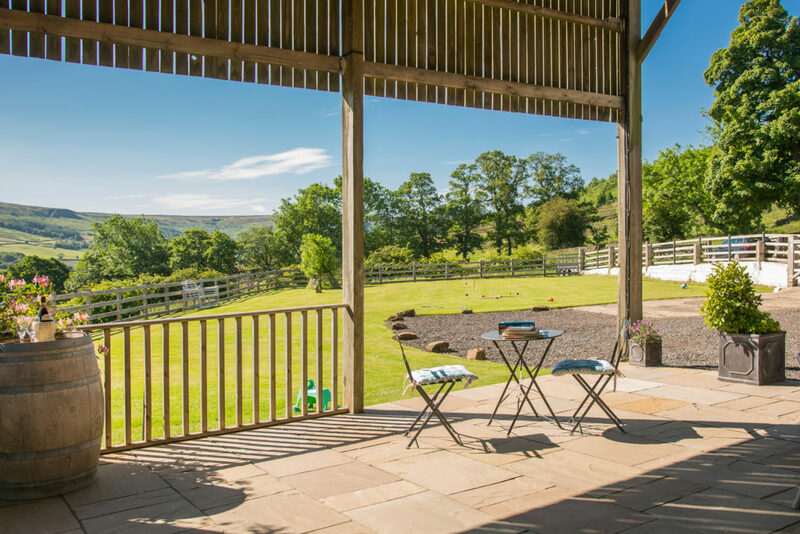 At home in the barn we offer a 5* gold luxury holiday for all – with or without a dog. We maintain a very high standard of furnishings and cleanliness. We trust that those guests who bring their dog will respect our lovely home by following our simple Dogs Welcome house rules so future guests will be able to appreciate Beacon View’s immaculate 5* gold standard too. Thank you for your consideration and co operation. Our dogs Welcome Pack will include poo bags and designated outside poo bin, outside water and food bowls and dog towels. We charge £30 for a dog stay, this is to cover the extra cleaning that will be required to help maintain our high standards. The countryside code must be followed at all times. It is a privilege to live, work and play in this beautiful National Park where there is Open Access Land where dogs must stay on public rights of way.